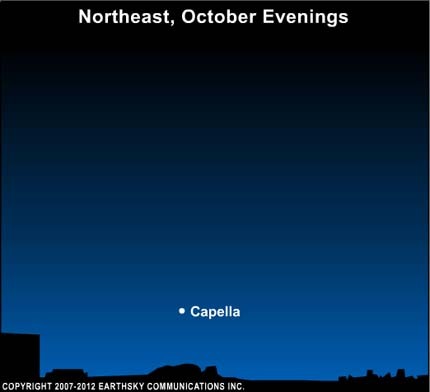 At this time of year, the star in the northeast at around 9 p.m. is Capella in the constellation Auriga. Every year around this time, we get questions from people who see this star twinkling with red and green flashes when it is low in the sky. On October 12, we talk about Arcturus, the brilliant star in the western evening sky. When Arcturus looms low or sets in the west, that is the time to look for Capella in your northeast sky. Capella is a golden star. If you could travel to it in space, you would see that it is actually two golden stars, both with roughly the same temperature as our local star, the sun . . . but both larger and brighter than the sun. Why does a golden star flash red and green when it is low in the sky? The reality is that every star’s light must shine through Earth’s atmosphere before reaching our eyes. The atmosphere causes stars to twinkle. The key to stars’ flashing colors is that, when you look at an object low in the sky, you are looking through more atmosphere than when that object is overhead. The atmosphere splits or “refracts” the star’s light, just as a prism splits sunlight. Capella’s red and green flashes do not come from the star itself. They come from refraction of Capella’s light by our atmosphere, when this star is low in the sky. Why are these flashes of color so noticeable with Capella, and not with others stars? Simply this. Capella is a bright star. It is the sixth brightest star in Earth’s sky, not including our sun. Capella is in the constellation Auriga the Charioteer. Since antiquity, Capella has carried the name “Goat Star.” Look for Capella low in the northeast around mid-evening, noting that this brilliant beauty sparkles with the colors of the rainbow.